There is a time when an effective cooperation between humans and robots has pivotal significance: it is in the precise instant that one “actor” is required to pass an object to another “actor” and, thus, to synchronize their actions accordingly. But how can this interaction be made more natural for robots? 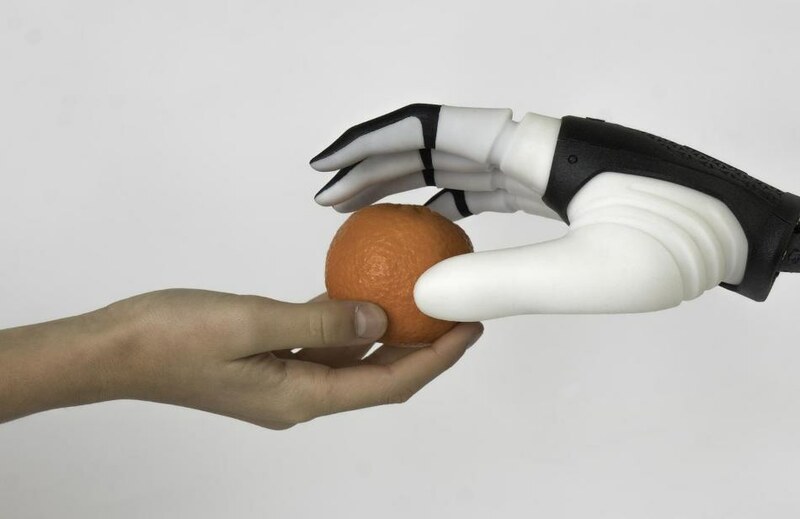 The solution lies in the research entitled “On the choice of grasp type and location when handing over an object”, published in Science Robotics by a research team of The BioRobotics Institute of Scuola Superiore Sant'Anna and the Australian Centre for Robotic Vision. The research exposes the guiding principles that govern the choice of grasp type during an exchange of objects, boosting teamwork between a robotic system and a person. The research, conducted in 2018, examined people’s behavior when they have to grasp an object and when, rather than using it themselves, they need to pass it on to a partner. The scientists examined the grasp choice and hand placement on those objects during a handover when ensuing tasks are carried out by the receiver. Passers are inclined to grasp the purposive part of the objects and leave “handles” unhindered to the receivers. Instinctively, this choice enables receivers to easily perform ensuing tasks with the objects. The collaborative study’s impact paves the way for new scenarios of technological innovation, offering advantages to numerous social activities where human-robot cooperation is well-proven and yet to be established. Indeed, it would be conceivable to perfect the production steps in an industrial setting while, in rehabilitation, robots could help patients with more natural and effective outcomes. Collaborative Robotics is the next frontier of both industrial and assistive robotics. For this reason, we need a new generation of robots designed to interact with humans in a natural way. These results will allow us to instruct the robot to manipulate objects as a human collaborator through the introduction of simple rules. Marco Controzzi, Researcher of the BioRobotics Institute, and Chief Investigator of Human-Robot Interaction Lab. Real-world manipulation remains one of the greatest challenges in robotics and we strive to be the world leader in the research field of visually-guided robotic manipulation. This research collaboration with Scuola Superiore Sant'Anna forms a vital partnership towards our goal of overcoming the last barrier to the ubiquitous deployment of truly useful robots into society. While most people don't think about picking up and moving objects - something human brains have learned over time through repetition and routine - for robots, grasping and manipulation is subtle and elusive.